Hector Arana Jr. figured out the tricky air of the Mopar Mile-High NHRA Nationals in Denver, setting the track speed record on his Lucas Oil S&S-powered Buell en route to his third final round appearance of the season. Getting a handle on the rare air of Bandimere Speedway is always a challenge for tuners. The Lucas Oil team has a pretty good notebook. Arana qualified number one and set the track elapsed time and speed records at Bandimere last season. The pace was set early this year. In the first session of qualifying, Arana lined up against the Harley-Davidson® of Eddie Krawiec. Arana spun the tire to a 7.42 but re-set his own track speed record to 187.03 mph as Krawiec set the track ET record with a #1 qualifying shot of 7.169 seconds. Krawiec wouldn’t get close to his number again but Arana Jr. chipped away at it, taking over the second spot at 7.182 in the last session while upping his speed record to 187.96 mph. His fast times on Saturday earned him a prize unique to the Mile-High Nationals – 500 Colorado Lottery tickets. In eliminations Arana Jr. got by a couple of Suzuki’s – “6-80 Freddie” Camarena and Steve Johnson – before facing Krawiec in the final. Arana had the quicker time in the final, 7.230 to 7.239, but Krawiec had a .011 holeshot advantage and took his first win of the season. "I wanted to win badly, but it was still a good weekend," Arana said. "The bike was running strong. We were the fastest bike all day today. The Harley bike was right there with me, and I knew it was going to come down to the wire." Krawiec and Arana hold their respective #1 and #2 positions in the Mello Yello championship points with only three races to go until the playoff Countdown field is set. 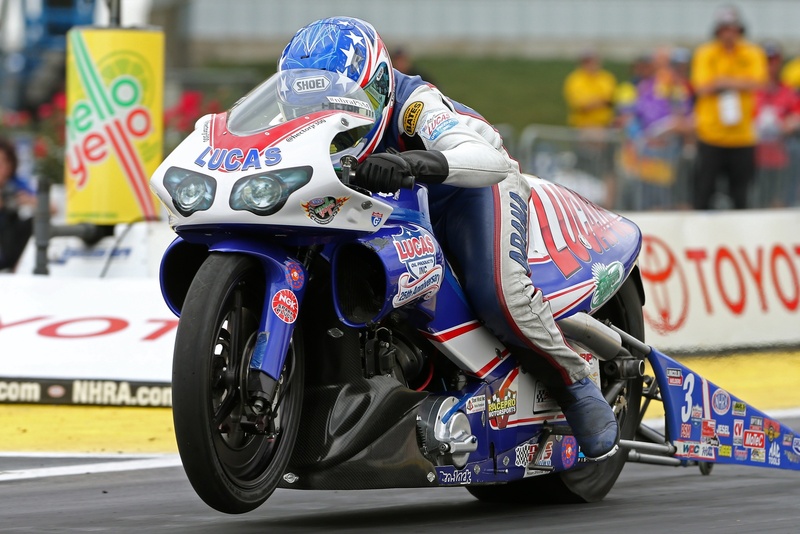 The next race on the NHRA Pro Stock Motorcycle tour is the Sonoma Nationals in California July 31- August 2.